What the data is must be linked to how it can be used. What’s really driving so-called big data isn’t the volume of information. It turns out big data doesn’t have to be all that big. Rather, it’s about a reconsideration of the fundamental economics of analyzing data. 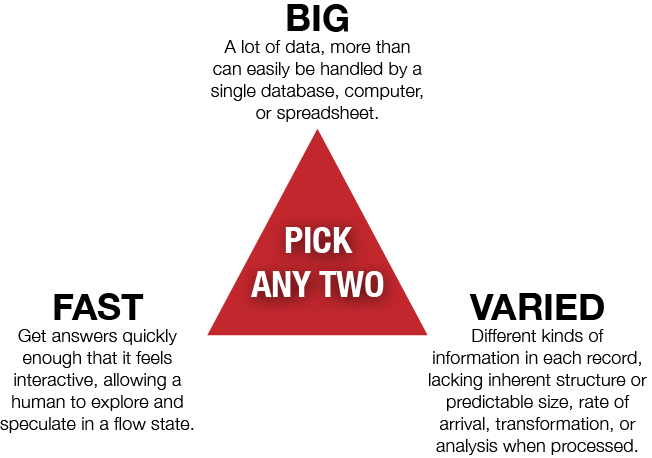 For decades, there’s been a fundamental tension between three attributes of databases. You can have the data fast; you can have it big; or you can have it varied. The catch is, you can’t have all three at once. I’d first heard this as the “three V’s of data”: Volume, Variety, and Velocity. Traditionally, getting two was easy but getting three was very, very, very expensive. The advent of clouds, platforms like Hadoop, and the inexorable march of Moore’s Law means that now, analyzing data is trivially inexpensive. And when things become so cheap that they’re practically free, big changes happen — just look at the advent of steam power, or the copying of digital music, or the rise of home printing. Abundance replaces scarcity, and we invent new business models. In the old, data-is-scarce model, companies had to decide what to collect first, and then collect it. A traditional enterprise data warehouse might have tracked sales of widgets by color, region, and size. This act of deciding what to store and how to store it is called designing the schema, and in many ways, it’s the moment where someone decides what the data is about. It’s the instant of context. You decide what data is about the moment you define its schema. With the new, data-is-abundant model, we collect first and ask questions later. The schema comes after the collection. Indeed, big data success stories like Splunk, Palantir, and others are prized because of their ability to make sense of content well after it’s been collected — sometimes called a schema-less query. This means we collect information long before we decide what it’s for. And this is a dangerous thing. When bank managers tried to restrict loans to residents of certain areas (known as redlining) Congress stepped in to stop it (with the Fair Housing Act of 1968). They were able to legislate against discrimination, making it illegal to change loan policy based on someone’s race. 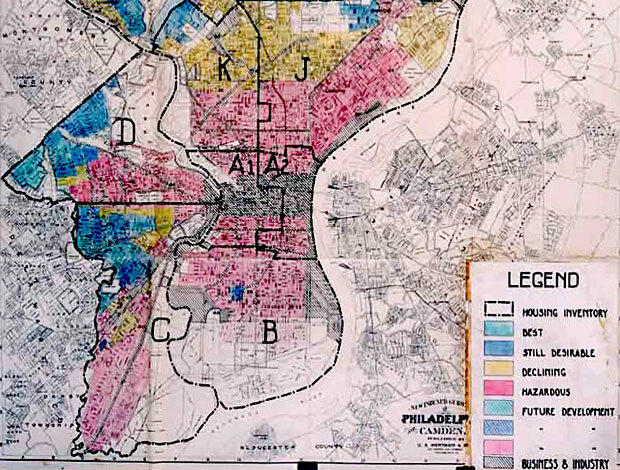 Home Owners’ Loan Corporation map showing redlining of “hazardous” districts in 1936. We’re seeing the start of this slippery slope everywhere from tailored credit-card limits like this one to car insurance based on driver profiles. In this regard, big data is a civil rights issue, but it’s one that society in general is ill-equipped to deal with. We’re great at using taste to predict things about people. OKcupid’s 2010 blog post “The Real Stuff White People Like” showed just how easily we can use information to guess at race. It’s a real eye-opener (and the guys who wrote it didn’t include everything they learned — some of it was a bit too controversial). They simply looked at the words one group used which others didn’t often use. The result was a list of “trigger” words for a particular race or gender. Now run this backwards. 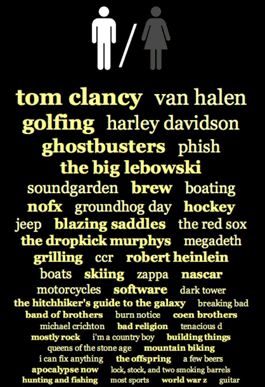 If I know you like these things, or see you mention them in blog posts, on Facebook, or in tweets, then there’s a good chance I know your gender and your race, and maybe even your religion and your sexual orientation. And that I can personalize my marketing efforts towards you. 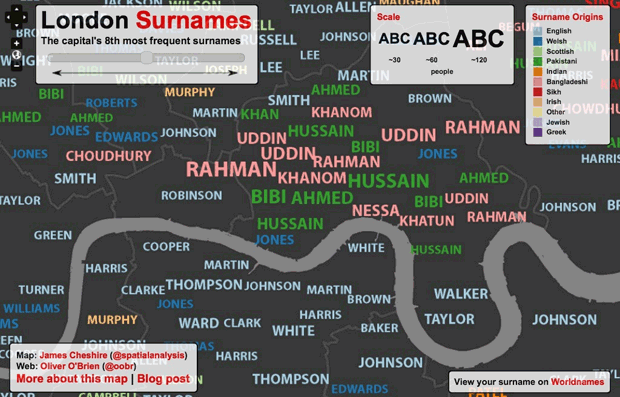 Screen from the Mapping London project. This TED talk by Malte Spitz does a great job of explaining the challenges of tracking citizens today, and he speculates about whether the Berlin Wall would ever have come down if the Stasi had access to phone records in the way today’s governments do. So how do we regulate the way data is used? There are brilliant examples of how a quantified society can improve the way we live, love, work, and play. Big data helps detect disease outbreaks, improve how students learn, reveal political partisanship, and save hundreds of millions of dollars for commuters — to pick just four examples. These are benefits we simply can’t ignore as we try to survive on a planet bursting with people and shaken by climate and energy crises. But governments need to balance reliance on data with checks and balances about how this reliance erodes privacy and creates civil and moral issues we haven’t thought through. It’s something that most of the electorate isn’t thinking about, and yet it affects every purchase they make. This post originally appeared on Solve for Interesting. This version has been lightly edited. Strata Conference + Hadoop World — The O’Reilly Strata Conference, being held Oct. 23-25 in New York City, explores the changes brought to technology and business by big data, data science, and pervasive computing. This year, Strata has joined forces with Hadoop World.